Utility Vehicle (UV) major, M&M whose product line-up is extensively dominated by diesel offering will soon be increasing the share of petrol and electric power-trains in their portfolio. 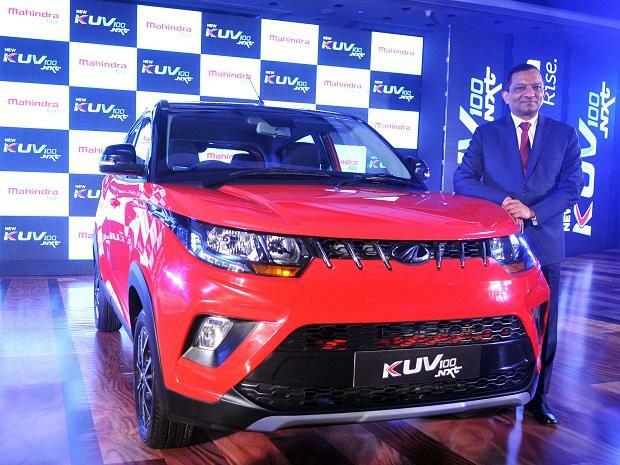 On the sidelines of the launch of the updated KUV1OO NXT, Pawan Goenka, MD, M&M said that they will be launching an electric version of the KUV1OO in 2018. The company also said that in future all their monocoque models will have an electric offering, though they did not specify the timeline. However, electrification of their best-seller, Scorpio is still uncertain. “Electrification of ladder frame (in Scorpio) is a challenge due to its heavy weight and it requires a powerful engine. Having said that, engineers have a solution for everything,” said Rajan Wadhera, President-Automotive Sector, M&M. After regularization of BSVI norms, diesel engines will become expensive. Cost of a 1500cc diesel engine will increase by Rs 80,000 while a 2,000cc diesel engine is likely to see increase of over Rs 1.20 lakh. Elaborating on the petrol engine road-map, Wadhera affirmed that Mahindra will be introducing two new petrol engines- a 1.5 Litre four-cylinder engine and a 2.0 Litre four-cylinder power-train to power bigger UVs. The company will be launching a petrol variant of its mini van, Jeeto which will be powered by a 600cc petrol mill. At present Mahindra only has a 1.2 Litre m-Falcon petrol engine that powers the petrol KUV1OO. The company claims to have a petrol share of over 50 per cent in the 60,000 units of KUV sold. Goenka said the company may look at cutting down on eVerito features for the EESL tender for electric cars. The company has not yet confirmed participation in second phase of the tender.